Formerly dropped by the Crypt Caretaker of Old Sebilis. I realize this item doesnt drop anymore and hasn't for 2 or more years, however, it looks as if it is tradeable (not "no drop") and I can't imagine anyone destroying one of these. Im on povar and interested for the right price.. Anyone have any info on a casters melee damage with this? Is it comfirmed as no longer dropping? so if you have one for sale on the Rodcet Nife server.. send me a tell. I said that a while ago, but I'm still pretty sure that pets at that level will be doing more than simply double the damage of the weapon. Also, I was referring to the fact that they don't have a damage cap from weapons, I've given a level 6 mages pet a 32 damage weapon and he was swinging for 64. Take that Befallen! some of those socalled "idiots" have int of over 310 at level 46. Using this is no bother. This is a melee weap that you use to jump in and wack for fun... not as a permanent use. A necro could act like a shadow knight but with a stronger pet with this. Nice to dream about, but forget it. Here's reality. All you're going to hit with this is another caster, in a duel, maybe. 1HB skill cap is just too low. And hell, some warriors freak out if you wade in just to stun. Level 40+ Chanters stepping in to MELEE would (rightly) get put on everyone's Do Not Group list. If you do it, you better explain that you're Full Mana, bored, and since we're fighting just this one easy mob, and everyone's all buffed up, hey what the heck. Even nuking would make more sense though...a little. Heh, if I go in to melee with my chanter and anyone in my group complains, that means no snakey for them. I can do a crap load of damage with self buffs, course if it does turn on me I know to back off. Course normally, yes a chanter who melees is an idiot, and I would never in a raid(unless I wasnt only chanter, but lately I have been). Hehe. I was thinking the same thing for my Chanter. I have a few folks I group with that can keep the mobs off of me and who don't mind me pretending I'm a tank (in the right situations--got to know when it's a walk in the park and when it's going to cause a wipe) so I can skill up my melee skills. It's just no fair that a chanter should have to create a pet at the 48th level to take out spiderlings efficiently for Pete's sake!! This item was dropped in the first week of kunark. I play on the Rodcet knife server and there are 2 on the whole server. The owner of one no longer plays. The owner of the last one is willing to sell if the price is right. His name is Bigsby. Send him a tell during game. Max I hit for with a 32/32 weapon on my chanter maxed out skill is 110. I wish my monk could equip this weapon. For 2hb i have a dmg 30 delay 40 weapon. Not that good in comparison to an ifs or tstaff but if i could equip this weapon i would do it in a heart beat. But then again, that's the POINT, isn't it? If a Warrior could equip this he'd spank everything around like Santa beating up a kid who pees on his lap (teehee). But the reality is, it is a sweet weapon that is horrible because it is only equipable by casters. Much like Tolapumj's Robe, this thing is basically either a joke or an alternate path that a caster could take. I have seen the occasional chanter buff himself with Rampage and SLtW or WR and slap things around pretty good, as long as the group has a good tank to keep aggro. I would never spend the time to raise my piercing past 30 (I had a Sarnak Ceremonial Dagger for a while in my youth) to do a small amount of damage compared to medding/nuking n such. #kennethr, Posted: Apr 22 2002 at 12:59 PM, Rating: Sub-Default, (Expand Post) how much would one go for on the nameless?????????????? this is an awsome weapon for casters. 60dmg 40dly!!!!!! If you are uber enough you can hold this item and still have 200int, ive seen it before. Please forgive me..The only Int caster i have is a 16th lvl Gnome mage for tinkering, but is the dmg on this weapon worth the -50 int you have to take? just wondering..well good hunting and safe journey to all. <insert Haste item here (FBSS)> + Illusion: Werewolf (Str + Haste) + Boon of the Garou (more ATK) + Beserker Spirit (more Str + Damage Absorb) + Rune 3 (why waste Peridots?) + <insert highest Haste spell here> + Rod of Annhilation + Maxed out 1HB = Chanter rocking da hizzouse!!! Sure, sounds like lots of spells, but it really isn't. A *decent* Enchanter would Haste himself BEFORE hasting his melees in order to time them, so you'd already have that. I personally still use Rune 3 because I just need to be protected from 1 or 2 hits in order to control a mob, so that's that. Illusion: Werewolf can be cast ahead of time. All that's left is Beserker and Boon. Boon is quick-casting, and Beserker doesn't take that long. Besides, you're going to want to wait til your tank gets in good aggro before wading into melee. With Clarity 2 up, you really shouldn't have mana problems. Throw in the new Meditation buff, Intellectual Superiority, and medding for short periods will do you just fine. So that takes care of the "go med!" problem. BTW, I do have experience as a meleeing Enchanter, and although there are critics, an Enchanter can keep down a VERY mean stun lock. The advantage to that is that you conserve your Cleric's mana on single pulls (unless you're an over-aggroing idiot), since a good stun lock will only take about half a blue bub of mana (if that). *In the 6th slot, I'd usually have Haste up, since that's the one with shortest duration. *Since I don't need Str for the stun lock, I get rid of Beserker, and throw in Color Skew. I always open with Color Flux, as it seems to resist least for me. Color Skew has a slow casting time, so I hit that one last. It's a real no-brainer: Open with Color Flux, then Color Shift right after, then Color Skew. Rinse and repeat. By the time you're done casting Color Skew, Color Flux should be back up. 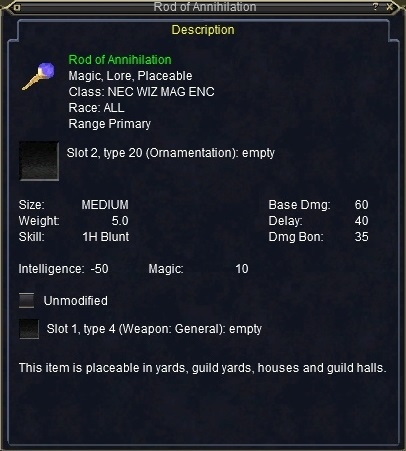 Anyway, I may have gone off-track somewhat, but my point was to not only say that this weapon would be deadly in the hands of Enchanter, but also to show how it could be done in an efficient manner. You are a crappy chanter if you think that your 1hb skill, 110 capped, is goning to hit with any damage or frequency on a mob over 44 (which is the lowest level you can cast boon on yourself). Your job is to handle crowd control and the pace of the battle. If you want to melee then play a warrior. A chanter is not a melee toon period! If you are doing melee then I feel sorry for the group you are in. You could be doing debuffs nukes or parking things that walk by so that your group has non stop pulls. That is what a GOOD chaner does, gets your group the most exp with the least amount of danger. Do not assume that chanters have to group. Or even want to. A good chanter is ready to do whatever happens to be needed. Mesmerizing Accuda and simply walking off would be appropriate here. We were given a certain amount of melee skills, they do work. Work as well as others? Nope, of course not. It's a GAME. Sometimes I want to have FUN. Listening to you tell me what I can/can't should/shouldn't do ain't on my list. Sounds to me like you've been in dreadlands or OT or whatever exp grinding place for far too long. Boon of garou no longer stacks with werewolf illusion, but it did. I've never had a problem stacking my rune with the berzerker line. (Then again I completely ignored them until I got the 200pt one.) Berzerker spirit does stack with whatever rune I cast, in whetever order. Trickster's augmentation does still stack over another illusion. FYI all they did to Boon of Garou was swap it from being primarily a buff with secondary illusion to being primarily illusion, thereby eliminating the stack. Only 2 things to point out about your post. Boon of Garou and Illusion:Werewolf do not stack. Rune and Berserker Spirit don't stack. That said getting in there and bashing some monbs around with this would be very fun. I want one someday. But please test strategies before you share them. Everything else in your post was very informative and correct. *Edit* I apologize boon does stack with other illusions. I tried it out again and you are correct. Bad me, no biscut. Actually Illusion:Werewolf and Boon did stack and may still stack, just have to cast the in the correct order. The Rune and Berserker Spirit not stacking is true. But yer going to get pulled over for speeding if you read speed limit signs like you do haste caps. :) Just remember there are only 2 songs that allow you to bust the haste cap. And no, scotty can not help you go any faster. can anyone tell me for sure if this is still droping? Hehe, yah you would start talking like dem der oggress and trollssys andd be blaming thingys to bloody, itty, bitty, parts andd all...and forget to be a spell caster. geesh.. imagine if a warrior got a hold of one of these dang things (if only). casters up front with warriors, but would probably still be smarter than the warriors anyway, -50 to some of them is a lot but still can get >200. I want one even though apparently they no longer drop. With the 36% haste on my tola robe this would be a kickass wpn. Out of mana- saddle up and bang some heads, all other times i would keep using my chetari wardstaff.